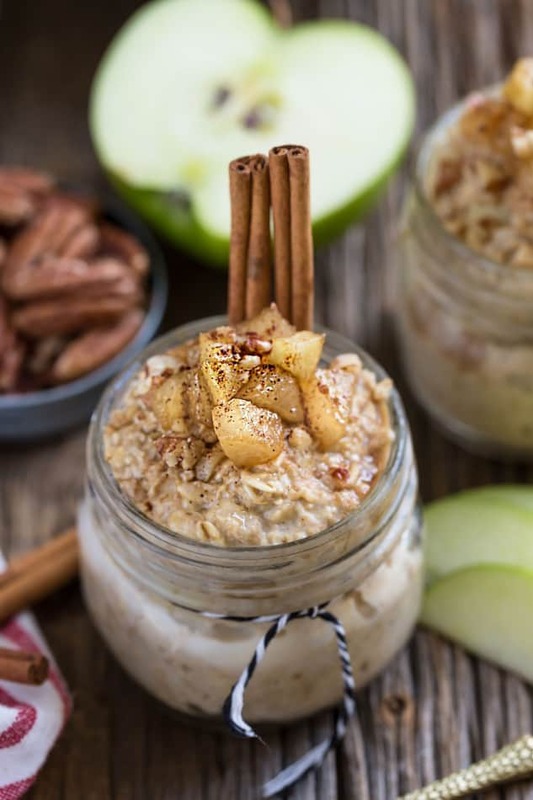 Cinnamon Apple Pie Overnight Oats makes the perfect easy and healthy make-ahead breakfast. Best of all, it’s like having dessert for breakfast that’s gluten free, dairy free and refined sugar free. Breakfast is my favorite meal of the day. You can usually find me starting the day with a green smoothie or a smoothie bowl and then after my workout I’ll have a plain bowl of oatmeal. Luckily for me, my kiddos love oatmeal too. To keep things interesting, I usually try to switch it up with steel cut, baked and overnight oats. 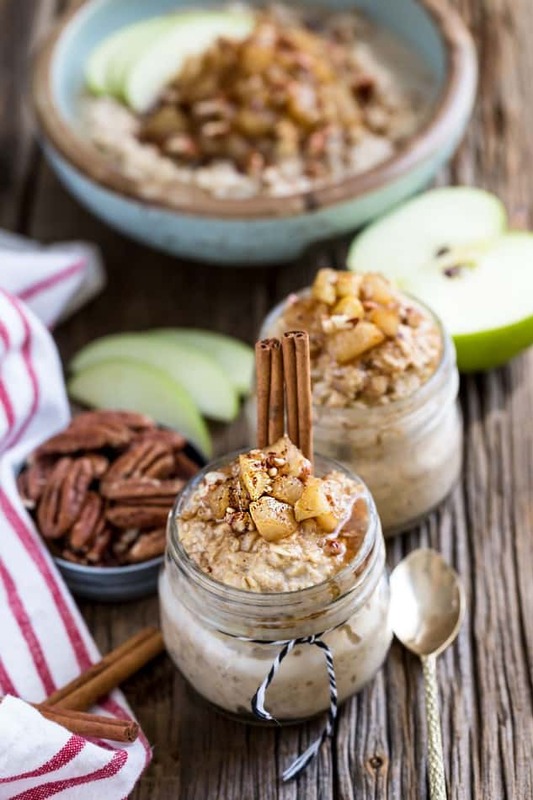 If you’ve never tried overnight oats, they are one of the easiest breakfasts that you can make-ahead. The best part about it is, you can whip up a batch and they will last in the fridge for up to 4 days. 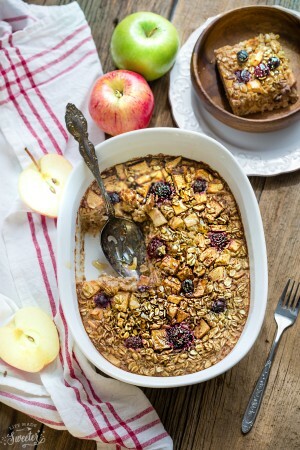 I make them almost daily during the summer and shared this strawberries and bananas version as well as this chocolate version and this time I decided to add all those same cozy flavors the same day I made my stove top Cinnamon Apple Pie Oatmeal. Simply layer the ingredients in a few mason jars and let them sit in the refrigerator for at least 4-5 hours or while you sleep…and that’s it! Overnight, the oatmeal softens and thickens into a creamy and dreamy breakfast that you can’t wait to get out of bed for! If you don’t have resealable mason jars, you can use any airtight container or even a large bowl covered with plastic wrap. Plus, I seriously can’t get enough of apples these days. 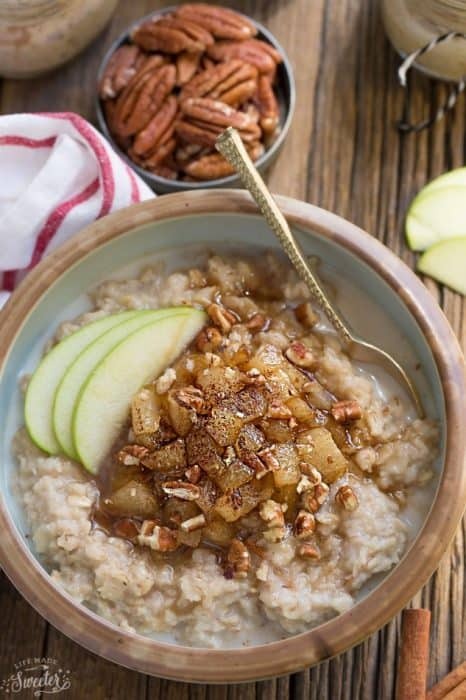 When I was pregnant with both my kiddos, apples and oatmeal were just about the only things I could eat during the first trimester. 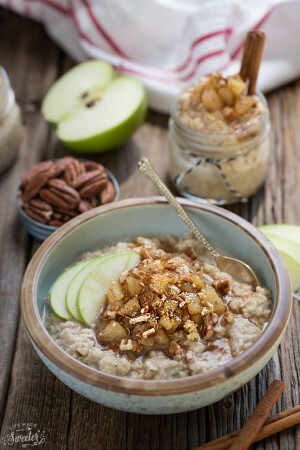 Topping these overnight oats with a caramelized topping just seemed right. It’s definitely my favorite part and totally makes this taste just like apple pie. You can make the topping ahead of time and store it in a separate container in the fridge. 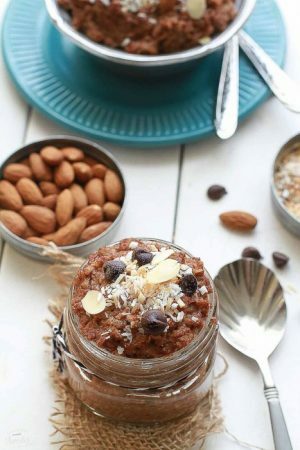 Then in the morning, you can heat it up and top over your oatmeal or enjoy everything straight out of your fridge. The chopped pecans add a nice crunch and you can totally add an extra splash of milk just before serving this. 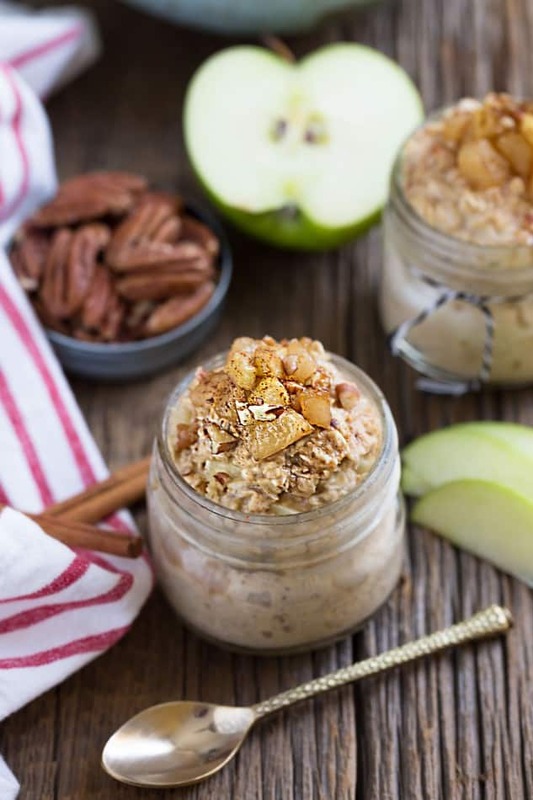 With these overnight oats, you’ve got a healthy breakfast that will help keep you feeling energized and ready to tackle the school or work day ahead. They literally take just minutes to prepare and you wake up to breakfast waiting for you. 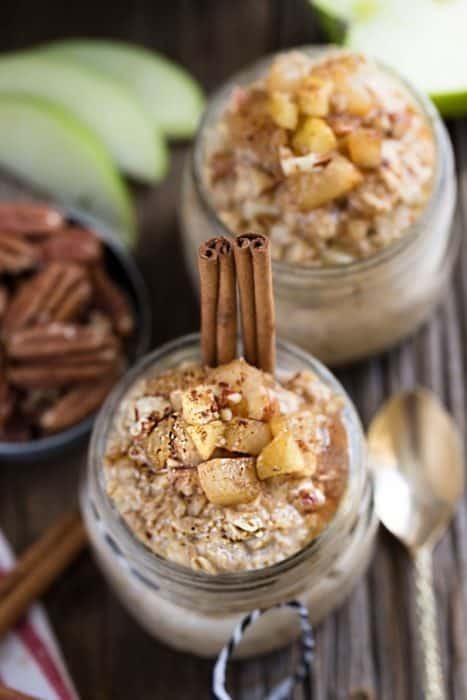 Cinnamon Apple Pie Overnight Oats makes the perfect easy and healthy make-ahead breakfast. Best of all, it's like having dessert for breakfast that's gluten free, dairy free and refined sugar free. For the apple topping In a small saucepan, heat coconut oil on medium high heat. Add apples, maple syrup and cinnamon and saute for about 5 minutes or until the apples turn golden brown and begin to soften. Remove from heat and set aside. (You can make this ahead of time and place in a covered container in the refrigerator).